UPDATE: This model has been discontinued and replaced with 31522 (white) and 31523 (silver). Capacity increased to 4.7 cubic feet. 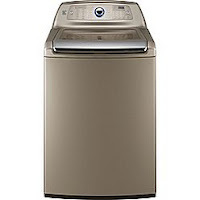 The appliance of the week is the Kenmore Elite HE top-load 4.5 cubic foot washing machine model 2927X. This washing machine is available in white (29272) or ginger (29278). The Kenmore Elite 2927X has a cavernous 4.5 cubic foot stainless steel wash basket. A king-size comforter can easily be stuffed in with room to spare. 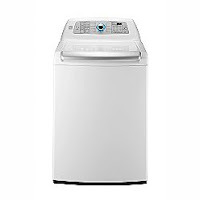 This capacity will reduce the number of loads of laundry you have to do, and help you get it all done faster. A stainless steel wash plate at the bottom of the wash basket provides the agitation for the laundry. This is a much gentler way of moving clothes than an old-fashioned agitator, so there should be less pilling and damage as a result. The SmartMotion wash motions, combined with reduced water usage, results in cleaner clothes due to more garment-on-garment contact. Just like you wash your hands with a little water, some soap, and lots of rubbing, that's just how this washer will wash your laundry. You can watch it in action through the tinted window in the lid. For washing towels, I recommend using the Sanitize cycle, which will utilize the internal water heater to get the wash load extra hot. This will eliminate all those nasty bacteria that make towels smell a little funky when they get damp. I also recommend using some Oxi-Clean or similar products (they're all the same, so whatever's cheapest is best) when you wash your towels in addition to detergent. This will not only clean your towels better, but it will clean your washing machine at the same time! If you've ever run your finger under the rim of an old-fashioned washing machine, you know exactly why a washer needs cleaning. Another great specialty cycle is Cold Clean. This will use cold water to achieve the same cleaning results as warm water, so you'll save even more energy. If you have workout clothes that are made from special materials that don't play so nice with regular washing machines, you're in luck. The 2927X has a Workout Wear cycle designed specifically for those fabrics, so they'll maintain their wicking and protective qualities. When you select a wash cycle based on the laundry you're loading into the washer, the cycle options will go to defaults for that cycle. If you want, you could just set the cycle and press Start. One easy step to get your laundry going. How easy! You can tinker with those settings if you like, but only in ways that won't harm your laundry. In other words, it protects you from accidentally hurting your garments by restricting access to certain options (for example, you can't set water temperature to hot with delicates). Goof-proofing is just another service the Kenmore Elite 2927X offers. Some specialty options on the Kenmore Elite 2927X are Save Energy+, which uses slightly cooler water to achieve the same cleaning results with less energy; Delay Wash, which lets you start the washing machine up to 19 hours after loading; Soak, for when you need to let something soak in detergent or bleach or other additives; and My Cycle, which lets you create a custom cycle for commonly used settings (also great for giving the kids a cycle for their clothes so they can help with laundry!). A direct-drive motor provides high spin speeds (1050 RPM max) and reliability backed by a 10 year component warranty. With a direct-drive motor, the spin cycle is very quiet, and the wash motions have great flexibility, which helps the machine achieve excellent cleaning results. Kenmore Connect is a great feature found on much of the Kenmore and Kenmore Elite high efficiency line-up (and some Kenmore and Kenmore Elite refrigerators). If an issue with the washing machine should arise, call 800 4 MY HOME, and they'll instruct you to hold certain buttons on the machine and to hold the phone near the Kenmore Connect logo. Diagnostic codes will go through your phone and be translated at the call center, so they can order parts immediately and send the diagnostic information to the technician who will be servicing your appliance. This saves a lot of time and makes repairs a one-visit affair. Now, that's convenient! A Modified Energy Factor of 2.41 exceeds the Energy Star standards, so the Kenmore Elite 2927X will help you save money on energy. It can pay for itself in water and energy savings within 10 years (if you get the matching dryer, it's like getting the dryer for free). With fantastic efficiency, modern styling, fantastic ease-of-use, great capacity, and excellent cleaning power, the Kenmore Elite 4.5 cubic foot HE top-load washing machine model 2927X is a worthy addition to your home appliances. 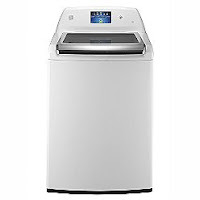 If you'd like a slightly simpler washing machine for a lower price, consider the Kenmore Elite 29002, which has 4.2 cubic foot capacity, no internal water heater, fewer wash cycles and options, and a solid lid without a window. If you like the Kenmore Elite 2927X but want something a little more sophisticated and WOW, take a look at the Kenmore Elite 2947X in white (29472) or ginger (29478). It has all the features of the 2927X, plus far more options for specialized laundry care thanks to its touch-screen control panel.